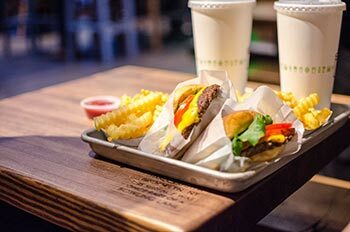 Shake Shack Inc. (NYSE: SHAK) will report fourth-quarter earnings after the bell on Monday, March 7. Analysts expect the fast-casual burger chain to report $0.07 per share on revenue of $50.4 million. If the company beats estimates again, the Shake Shack stock price will likely jump in response. After all, shares of SHAK saw a weekly gain of 10% when the firm beat Q3 earnings expectations on Nov. 5. But Money Morning Chief Investment Strategist Keith Fitz-Gerald – a 30-year market veteran who correctly predicted the dot-com crash – says Shake Shack stock isn't the Wall Street darling millions of investors think it is. "What's happening with Shake Shack is a very serious warning that the markets have become frothy and that investors are chasing hot ideas rather than results," Fitz-Gerald said last July when the stock was trading a whopping 142% higher than its IPO price. Shake Shack went public in January 2015. While some will see a Shake Shack beat as a reason to buy in, Fitz-Gerald has kept SHAK on his "stocks to short" list. There's one $50 million reason why Shake Shack stock is a short – even if the company posts another strong quarter. When SHAK stock hit the market on Jan. 29, 2015, it was one of the most highly anticipated debuts of the year. The Shake Shack IPO raised $105 million by offering five million shares for $21 each. SHAK shares skyrocketed 119% on their first day of trading to close at $45.90. According to Renaissance Capital, a manager of IPO-focused ETFs, it was the fourth best-performing IPO of 2015. Although the Shake Shack stock price peaked at $92.86 on May 22, it still saw an 89% gain from its IPO price by the end of 2015. The blockbuster market performance coincided with a series of strong earnings reports. In its Q1 2015 earnings report, Shake Shack posted $0.04 per share on revenue of $37.8 million. That beat Wall Street expectations of $0.03 per share on revenue of $34 million. Shake Shack's earnings growth continued when the company posted $0.09 and $0.12 per share in Q2 and Q3. Those numbers smashed analyst estimates of $0.03 and $0.07 for the respective quarters. The biggest drag on the Shake Shack stock price this year will be its absurdly high valuation. Although Shake Shack trades lower than competitors like McDonald's Corp. (NYSE: MCD) and Chipotle Mexican Grill Inc. (NYSE: CMG), its price-to-earnings growth (PEG) ratio sits at 4.74. This is unrealistically high considering a PEG ratio above one means the stock is overvalued while a ratio below one means it's undervalued. Also, Shake Shack's 2016 price-to-earnings (P/E) ratio is 128.84 – nearly six times higher than that of McDonald's and double that of Chipotle. Those metrics conclude that each Shake Shack location is worth roughly $50 million as of last September. That's illogical considering how little the company has grown during its seven months on the market. "If the Shack is going to achieve a McDonald's-like valuation per location, the company would have to open approximately 864 restaurants representing a 929% expansion from the 84 locations they operate today," Fitz-Gerald explained. The burger chain's artificial valuation is a perfect example of investors' tendency to buy shares based on hype rather than financial data. But hype can only last so long, which is why Fitz-Gerald considers Shake Shack stock one of the best short candidates of 2016. In fact, investors who followed Fitz-Gerald's recommendation to "short the Shack" last May are enjoying a 44% return. "The deal breaker for Shake Shack – at least in my book anyway – is that it's always carried an insanely high and unjustifiable valuation," Fitz-Gerald said last November. "As much as I love the food, I think Shake Shack stock still has more room to the downside." The Bottom Line: Shake Shack stock had a superb year in 2015. Thanks to frothy hype and strong earnings reports, SHAK stock soared to a nearly 90% gain last year. But the company is insanely overvalued right now. With absurdly high PEG and P/E ratios compared to its more seasoned competitors, we recommend shorting Shake Shack stock in 2016. Shares will see a drop-off this year as the hype runs out of steam and investors see the company for what it really is. Alex McGuire is an associate editor for Money Morning. Follow him on Twitter at @AlexMcGuire92 for all of the biggest news on Shake Shack stock.